From investing in a colourful radiator to simply adding a splash of paint, Pantone’s Colour-of-the-Year – named Greenery – is the go-to colour this spring when it comes to bathrooms. Whether you prefer a subtle hint, or a statement look, these shades are easy additions to your home decoration. Here, we pick out the top ways to embrace the ‘greenery’ mood – including using a feature wall, coloured tiles, statement wallpaper, bathroom friendly plants and accessories. Giving your bathroom a bit of an update or a new look doesn’t have to mean starting from scratch and spending a lot of money. With some simple tweaks and modifications, your bathroom can look refreshed as well as reflecting the current design trends. Pantone’s Colour-of-the-Year is a great way of discovering the latest must-have colour for interiors and it’s perfect if you’re looking to update your bathroom. Greenery is a refreshing, rejuvenating and revitalising colour. The fresh and zesty shade evokes the first days of spring – with a nod towards nature’s greens, flourishing foliage and the great outdoors. Create a feature backdrop in your bathroom by adding a splash of colour to a wall of your choice. Whether it’s the surface behind your shower, basin, or bathtub, this is a cost efficient way of tapping into the greenery trend and can even be changed, from one shade to the next, each season. 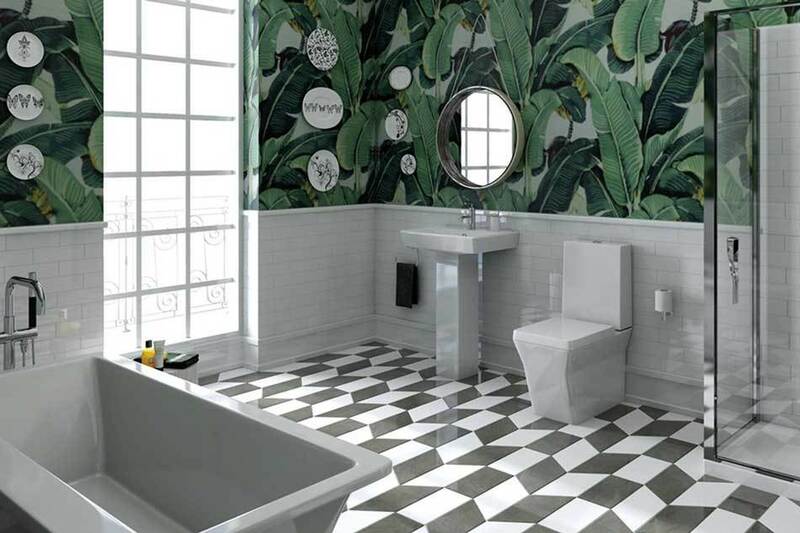 Whether you opt for floor or wall tiles, printed tiles are a must for bathrooms this season and there is a variety of patterns to choose from including shades of green. Hexagonal tiles on walls and floors were extremely popular last year, and are on the rise again in 2017. 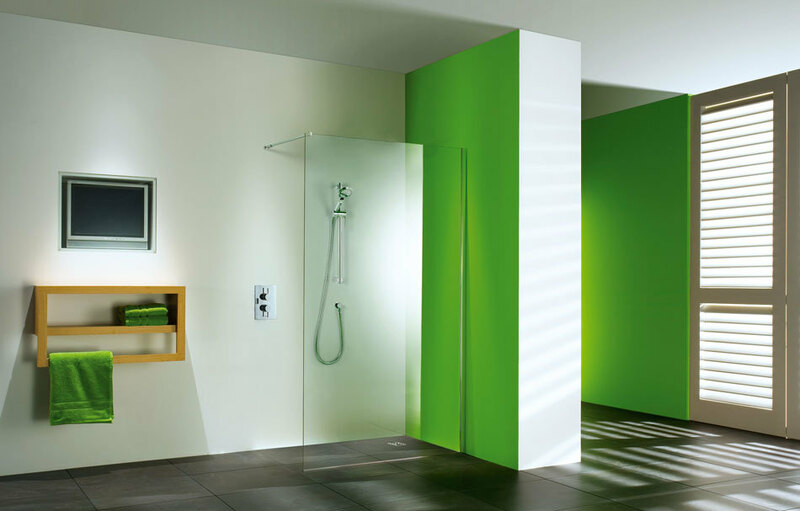 If something plainer is more your style, then you could check out glass or acrylic bathroom panels. They’re ideal for splashbacks, bath surrounds and shower spaces and available in a host of colours. 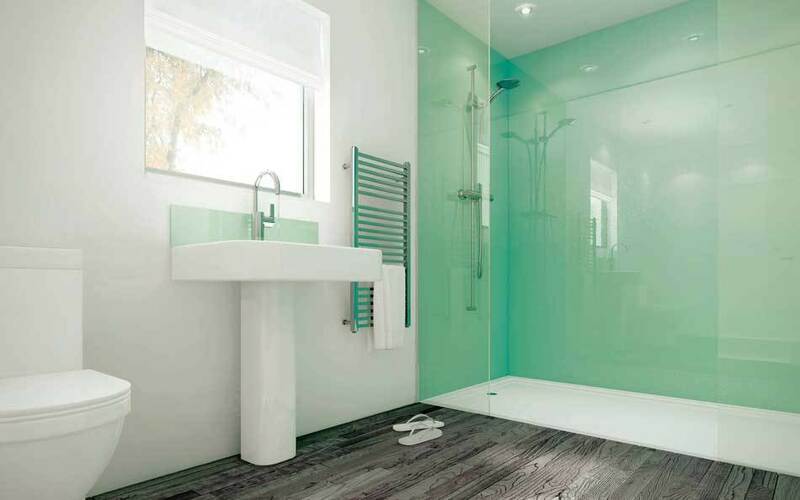 A sleek and modern bathroom doesn’t necessarily mean shiny, colour-block walls. This year, why not have fun with your bathroom and opt for printed statement wallpaper. This is a great way of adding a zone of colour to your bathroom without picking one particular shade. A current firm favourite is the tropical print, featuring large leaf cutouts in a mixture of shades from emerald, jade and olive to lime, bottle and sea green. Botanical wallpaper adds drama to this Kohler Rêve bathroom.You can see this range at our Nottingham and Chesterfield showrooms. If picking up a paintbrush isn’t your thing, simply add a touch of the colour with a few accessories. One of the best ways is with an assortment of indoor plants. Cactuses, Succulents, Ferns, Orchids and Peace Lillies love humidity and thrive in the bathroom. Thinking about the colour of your blinds, towels and bath mats is a quick fix too along with green glass or marble ornaments. 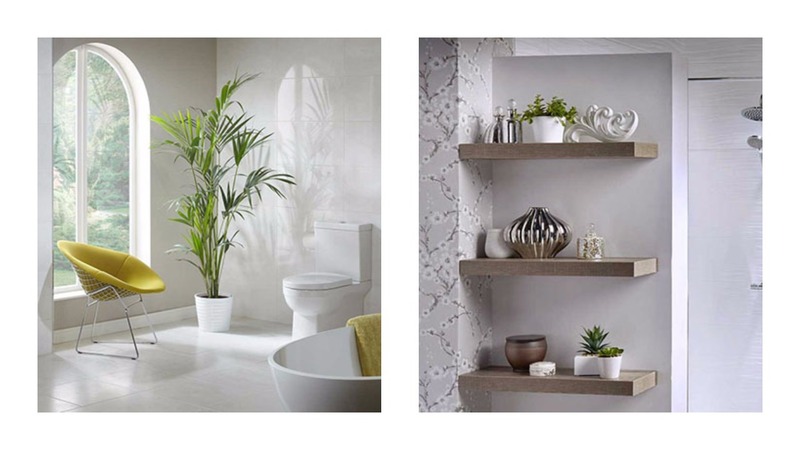 Humid loving plants help to bring the outside into your bathroom.